American Freight of Ohio, Inc. & Related Companies (“American Freight”) is a leading discount furniture retailer comprised of 100 retail stores in 18 states across the U.S., offering customers a variety of high-quality mattresses and bedding, bedroom sets, dining room sets, and upholstery at consistently low prices. The principals of MelCap Partners successfully represented American Freight and its shareholders in this sale transaction. 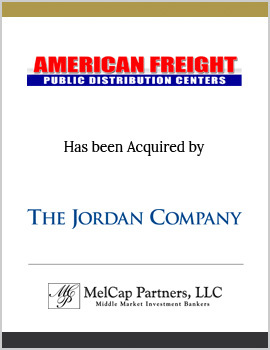 American Freight was sold to The Jordan Company, a private equity group with offices in New York, Chicago, Stamford, and Shanghai.